When President George H.W. Bush lost the White House, J.T. Ellison was out of a job, too. Her stint in high-level politics over, she moved to Nashville with her husband. Having injured her back and with no job, she spent most of her time at the public library. 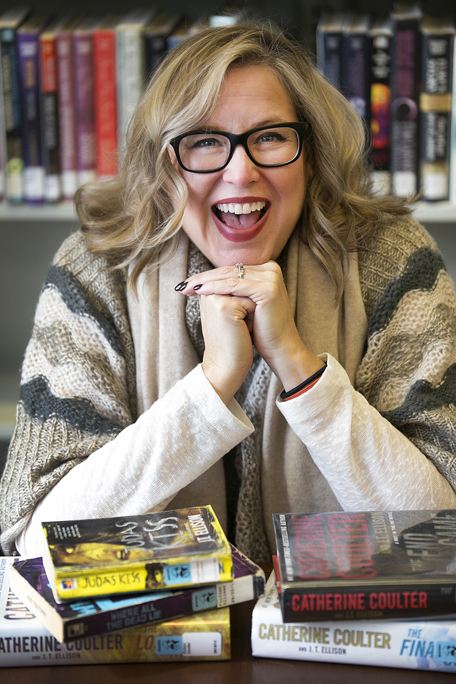 Sandford’s thrillers provided the inspiration Ellison needed to make a career change and pursue writing – it turned out to be an excellent idea – propelling the former White House intern into the heart of Nashville’s literary scene. Today, she is the author of 15 books, including co-writing with New York Times Best Seller Catherine Coulter, and she has been tapped as co-host for a revamped “A Word on Words,” the venerable Nashville Public Television book program featuring the late John Seigenthaler, along with Mary Laura Philpott. “J.T. is very much a rising star,” says Jeff Abbott, New York Times Best Seller author. Abbott and Ellison have been friends, and fans of each other, for years. During college, Ellison double majored in creative writing and politics, mixing her lifelong love of writing with her love of politics. When one of her professors told her she could never get published, she stopped writing for many years and focused on politics. Her political career started with an internship at the White House. Despite turning down a job to finish her post graduate education, a decision she regretted, Ellison ended up back at the White House after graduation. She became a confidential assistant to Dr. Allan Bromley, the nuclear physicist who served as science adviser for the first President Bush. While she enjoyed her time in that office, she says she didn’t make the most out of it. Nashville resident J.T. Ellison is the author of 15 novels with two on the way (“No One Knows” on March 22 and “The Devil’s Triangle” with co-writer Catherine Coulter on June 14). Her next job took her to the Department of Commerce, where Ellison was getting her hands dirty in policy and speech writing. After reading Sandford, the writing bug had hit Ellison again. She knew that she needed to be a writer, but it took her time to actually do it after her experience in college. But she didn’t know the proper procedure and or have the necessary knowledge to become a published author. Everyone rejected her manuscript. One professional told her that her writing was like everything else that was already out there. Ellison threw out most of her novel and started over, becoming devoted to writing. “I got really serious about writing in 2003,” Ellison says as she explained how she brainstormed the character of the Nashville Homicide Lieutenant Taylor Jackson. After creating a character and a location, Ellison had to make connections with the Metro Nashville Police Department to gain the institutional knowledge of being a homicide detective. 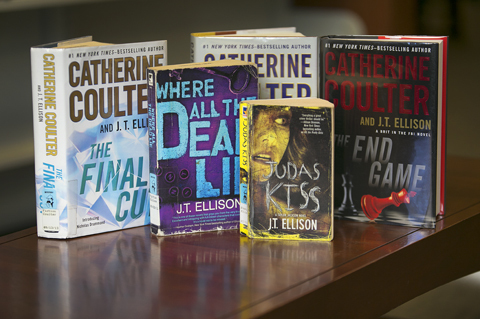 Some of the novels Ellison has written alone and with Catherine Coulter. Ellison ended up going on eight or nine trips with the police department over the years. Ellison went on to write seven Taylor Jackson books. Her debut, “All the Pretty Girls,’’ was released with rave reviews. Another of Ellison’s series is about Samantha Owens, a former Nashville medical examiner, and Taylor Jackson’s colleague, who lost her children and husband in the Nashville flood. This series follows Owens as she leaves Nashville for Washington, D.C., and the books are a wild, thrilling ride that takes the reader across America hunting down criminals and terrorists. The series reads like a thrilling movie, with twists and turns until the end. The first book in the Sam Owen series, “A Deeper Darkness,’’ was one of the better books Ellison has written in her career, Ellison admits. That first Sam Owens book led to the partnership with Coulter. Their story features Nicholas Drummond, a Scotland Yard Chief Inspector who joins up with the FBI in America, and is co-written by Ellison. 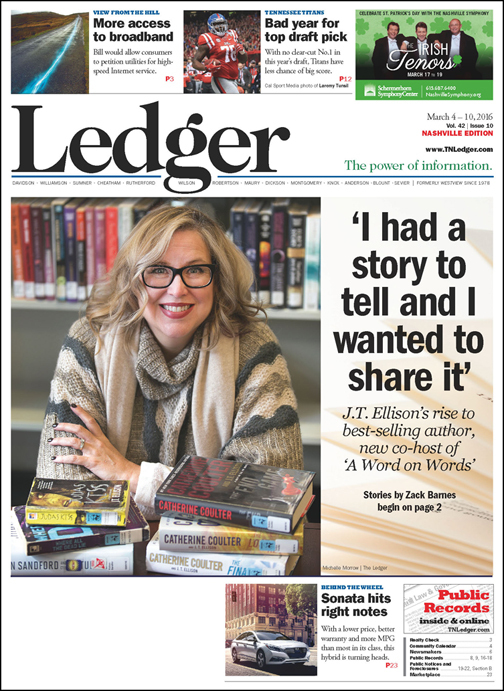 “When I decided to co-write,” says Catherine Coulter, “both my husband and I picked up 20 suspense thrillers each, and what do you know – independent of each other, we both picked J. T. Ellison. Writing is known as a solitary and lonely profession, but that changes completely when co-writing a novel. Ellison flies out to California, where Coulter is based, at least three times a year. Other than that, the two authors communicate from afar every single day through email and phone calls. The in-person meetings are very important to their writing process. Large amounts of work go on between the in-person meetings. The relationship between the two authors has grown into a deep friendship. The partnership with Coulter got Ellison her first ever New York Times Best Seller. She remembers the exact time and place when her agent called. Her next goal is to be on the New York Times Best Seller list with just her name. Ellison’s book deals are becoming larger with each signing. The website Publishers Marketplace tracks reported book deals, with literary agents giving a wide range of for how much the books sold. Before her latest book sales, Ellison sold three books for between $100,000 and $250,000, also known as a “good deal” in the publishing world. For her latest three-book deal, Ellison had significant increases for between $251,000 and $499,000. Miller knew from the beginning that he had found someone special. Ellison is also making waves outside of her book writing. Her career has taken her to open her own book press, Two Tales Press. Two Tales Press is offering short stories in e-book form with hopes of expanding to printed books in the future. But what is most important is that Ellison has the freedom she has always wanted. But don’t look for Ellison making the change to completely self-publishing. “Do I want to spend all my time self publishing my work? No. I don’t,” she says. She understands how important it is to have a team in the traditional book market to guide her through publishing. But she will continue to make the decisions that she thinks best for her, which means you will be seeing more stories publishered through Two Tales Press. Ellison says readers loved to be tricked, and at the rate Ellison is going, readers are going to be getting tricked for many years to come.